CorD Magazine, established in December 2003, is an independent English-language monthly publication, which is published in Belgrade, Republic of Serbia, by company alliance international media – aim. 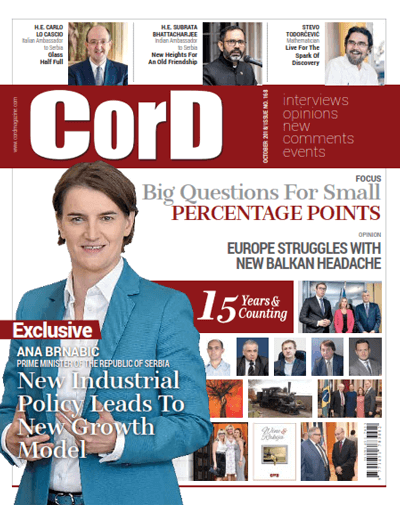 CorD is a monthly English language news magazine for unbiased, independent coverage of business, finance, politics, diplomacy and society in Serbia today. For more than 15 years, both local and global brands have been utilising CorD Magazine in order to present their operations to a carefully selected target readership that comprises economic, business, political and other leaders in Serbia and the region. CorD, in both print and digital format, has long been recognised for its high global graphics standards, the most influential interlocutors and its independent editorial policy. This is confirmed by many years of continued cooperation with the most successful domestic and foreign companies, organisations and associations. We have to date published 450 special editions in cooperation with governments and ministries, business associations, chambers of commerce and diplomatic missions. CorD Magazine is the leading regional business-orientated lifestyle monthly in English. CorD is the business magazine with the highest circulation in the region. It is distributed every first day of the month to the hands of business, political and diplomatic leaders in Serbia and the region, in addition to all members of the Serbian and regional governments. The readership is comprised of more than 50,000 monthly readers. Our cover page has featured over 800 officials from Serbia, the region, the European Union and the wider world. CorD’s interlocutors are the most influential political, diplomatic and economic leaders – people who have something to say, leaders who make decisions. We have celebrated and affirmed almost all diplomatic, economic, business and government activities that have led to the advancement of good relations between Serbia and the world.